Eyes are such a focal point of the face. As we age, these “windows to the soul” can wrinkle and droop, often changing our facial expressions significantly—and possibly sending a message we don’t want to send. Eyes have an uncanny ability to “say” things for us before we speak. As author Tarjei Vesaas said in The Boat in the Evening, “Almost nothing need be said when you have eyes.” A “twinkle” of the eye can convey vast amounts of non-verbal information, so it’s only natural to want these special facial features to maintain an appearance that expresses our distinct personalities, emotions and thoughts. It may come as no surprise, then, that Dr. Brent J. Smith is fascinated with plastic surgery on the eye area. With more than 25 years in the business, and countless hours perfecting his skills in surgical facial procedures with the most effective technology-enhanced trends, Dr. Smith considers his work on the all-important eye region a true art form—and so do his satisfied patients. Not only is every pair of eyes different, but so is how each set complements a face, as well as what specific signs of aging those eyes are actually showing over time. Every face is as distinct as a fingerprint and we must treat it as such, with great dignity. Because eyes are so prominent on the face what doctors do to them surgically affects all other areas of the face. That’s why it’s nearly impossible to request a “packaged” eyelift and expect to see natural results. 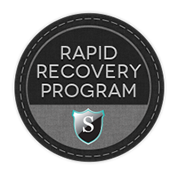 In fact, this is part of a large misconception we regularly address at Smith Cosmetic Surgery. One of the top complaints about wrinkling eyes is linked to those tiny, bunched, stubborn lines that accumulate at the corners of the eyes after years of making repetitive expressions. While they might not make you very happy, crow’s feet are commonly referred to as “happy lines”—those creases that develop during the billions of tiny muscle movements your eyes make over a lifetime. However what many people think are crow’s feet are not actually wrinkles from squinting or smiling, but rather lines created by folding skin that naturally begins to sag as it loses collagen. Crow’s feet, on the other hand, are largely genetic—a frustrating side effect that compounds over time in people with a specific type of musculature makeup. That means if your parents struggled with this type of wrinkling, you may as well. For example, people in their 60s have come into Smith Cosmetic Surgery with deep crow’s feet, but no other visible horizontal lines on their brow. On the flipside, some women in their 20s may show no crow’s feet yet can make an accordion with their brow line. It’s just the way the face moves uniquely for each person. What’s commonly mistaken for crow’s feet may actually be creasing on the upper eyelid, also known as “hooding,” which happens gradually and naturally as skin around the eyes begins to relax. While the loosening of skin over the eyes can lead to a wrinkling effect near the corners of the eyes, it is not the typically inherited condition known as crow’s feet. Likewise age-amplified fat pockets that show up under the eyes can accentuate existing smile lines around our eyes, but this, too, is a slightly different sign of aging and therefore needs to be treated with a custom approach with upper or lower eyelid surgery. Distinguishing between these two common eye issues is the first thing we must address with new patients. Knowing what has actually caused the wrinkling helps Dr. Smith determine which approach will work best to treat the condition, such as an eyelift in combination with enhancements on the upper third of the face, often alongside a mini facelift. How do I Know I Have Crow’s Feet? Women often start to notice hooding when their eye makeup begins to smear. That morning mascara applied in the far upper reaches of the eyelashes somehow transfers down onto the eyelid and gets smudged with other makeup. It can be a daily struggle as simple as makeup application that sends someone into our surgery center. Men often notice crow’s feet in the summer after a round of golf without enough sunscreen. Suddenly a burned or tanned face reveals something unsavory: bright white “squint” lines inside those crow’s feet that were hidden the day before. 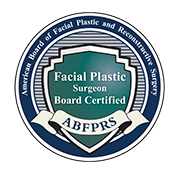 Also known as blepharoplasty, the eyelift is one of the most commonly requested procedures at plastic surgery clinics nationwide. This form of facial cosmetic surgery is designed to treat the upper or lower portion of the eye—or both, depending on needs. While eyelid surgery is not a “cure” for hereditary crow’s feet, it can dramatically impact the look of aging eyes, especially when performed in tandem with a mini facelift or complementary procedure on the browline and cheeks. On the lower half of the eye blepharoplasty can alleviate “hallowing,” a sunken look created by a loss of fat under the eye, or the opposite under-eye issue—bags, which happen when older fat deposits actually expand over time. On the upper eyes, blepharoplasty can address the drooping skin that sags over the eyelid and can interfere with vision. An eyelift on the upper lid works to tighten both the musculature and skin around the eyes. A supplementary “browlift” is also a common counterpart to an eyelift, because it can effectively reduce “hooding” on the upper eyelids and those forehead lines that can add age to the eyes. One the most popular prescription-strength injectable facial fillers, Botox was recently approved by the FDA for use on crow’s feet. While it has been used for years as an off-label procedure to treat the eyes, the proven injectable is now enticing more women and men who may have shied away from the product in the past. By inhibiting the strength by which you can crease the tiny muscles around the eyes, Botox can help younger people prevent the lines from forming in the first place or older adults from adding to the damage. In addition to crow’s feet, this injectable enhancement, which typically lasts four to six months, works well on forehead lines, making it a helpful companion in the fight against wrinkles on the upper third of the face. Laser resurfacing is a non-surgical procedure that works much deeper than a chemical peel to refine the look of facial skin. While it’s not a permanent fix for wrinkles around the eyes such as crow’s feet, laser resurfacing using a powerful fractional CO2 laser can significantly change the appearance of skin on the face, making features appear brighter and more youthful. Administered in a series of three procedures at six- to eight-week intervals, each laser resurfacing process builds on the last, carefully stripping away old, dry and damaged layers while stimulating the body to “grow” new skin during the healing process. When used in conjunction with prescription-strength eye creams and Botox injections, this minimal-downtime procedure can work as a formidable non-surgical alternative for reducing the appearance of wrinkles around the eyes. Our eyes are our individual signature. That’s why every cosmetic surgical or non-surgical facial procedure is designed around your needs. 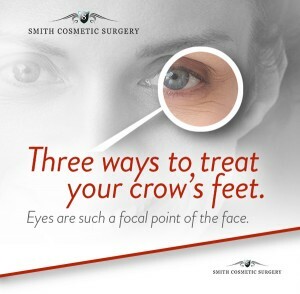 Whether you’re noticing crow’s feet for the first time or drooping eyelids that are affecting vision and confidence, Dr. Smith can create a custom treatment that will enhance the beauty of your natural eyes. Come see for yourself.